It is the cyber security pioneer John McAfee, the founder of McAfee Associates, now reputed to be the world’s largest dedicated security technology company. Jones has used McAfee’s links to cryptocurrency and conflict with the US regulators as a key feature in a new exhibition in Edinburgh combining art and technology. Canada-born Jones is using augmented reality to give the visitor an opportunity to turn artworks into film clips simply by holding up a smartphone or tablet against each painting and seeing the story behind it come to life. 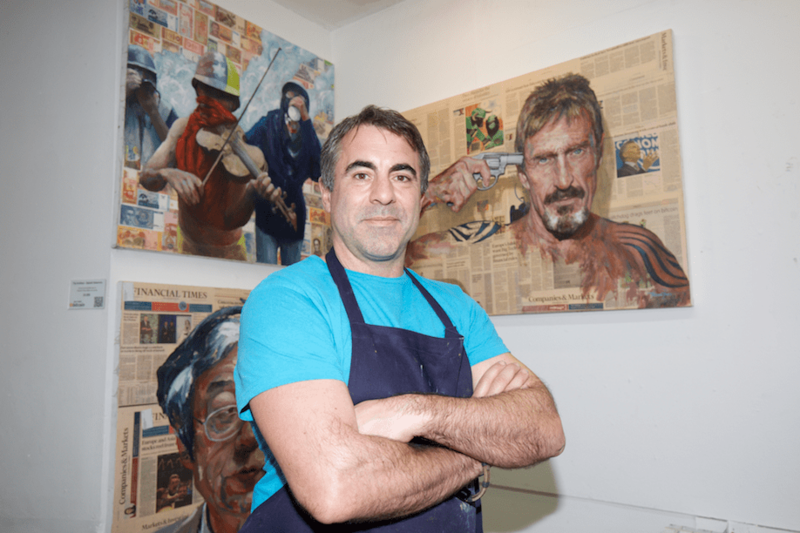 The picture of McAfee is one of twelve in the exhibition, inspired by bitcoin and the cryptocurrency markets, pulled together by Jones who arrived in Scotland in 1999 and graduated from Edinburgh College of Art in 2008. He is currently artist in residence at the Edinburgh Academy. He first came to public attention during the 2014 Royal Scottish Academy open exhibition when he photographed 60 of the works on display and, with the help of the AR app, superimposed his own work in their place so that anyone using the app could point it at the works in the official exhibition and, through their smartphones, view Jones’ work hanging on the walls. The exhibition also includes a portrait of the real Satoshi Nakamoto, the man who shares his name with the founder of bitcoin, alongside other paintings based on phrases and imagery common to finance and cryptocurrencies such as Riding The Wave and HODL (‘hold on for dear life’). Alongside the exhibition, Jones is ‘hijacking’ the National Portrait Gallery, using AR to transform many of the gallery’s historical portrait paintings into the elite figures of the cryptocurrency community. Visitors to the gallery can use the smartphone app CreativMuse to engage video and links and learn more about bitcoin and other cryptocurrencies via the paintings. For Jones, these additional layers are neither a gimmick, nor an add on, but an essential part of the paintings and his creative process. He says: “I want to find ways to engage the senses and create a different experience to what a painting normally provides. Likewise, when it comes to his reputation as a disrupter of art, Jones acknowledges that the paintings are only a part of this, and that technology has played a large role in cementing his status as the outsider artist who breaks into the established venues and makes them his own. That is not to say the paintings are unimportant. They remain at the heart of what Jones is doing. As he says: “You have to create the most visually striking painting to draw people in. The art itself has to make a statement. Disruption: The Art of Blockchain runs from 22 to 26 October at Dundas Street Gallery.